Saira Martinez, 18, from South Carolina, born in Mexico. When I was eleven, my mom went to a local thrift store to buy me a birthday present. She intended to buy movies and a doll for me, instead, she gave me a role model. She returned with discs for “Cosmos: A Personal Voyage by Carl Sagan.” Each of his episodes taught me how to understand the world around me and instilled in me a love for science. My middle school and high school years would be filled with buying his books and even buying my first telescope. Even though he passed away before I was born, he will always play a role in who I aspire to be, through his books and work. Now, thanks to DACA and TheDream.US scholarship, I can pursue that dream. I am a first-generation college student. My parents’ education ended for them in elementary school. I want to succeed in honor of their sacrifices. America has been my home from a very young age. While Mexico will always hold a special place in my heart, America holds my moments of accomplishments and friendship, despite the difficulties of politics and parts of my family’s experience. In third grade, we were assigned an ancestry project. I went home to ask my parents about our family. This is when they told me that we are undocumented. Growing up in America has opened various doors of opportunities for me, just as others have been slammed shut due to my status. From a young age, I learned firsthand the pain of intolerance and racism. Later on, I learned the role that politics plays in my situation and that there are millions more just like me — struggling in a country they call home. I remember very little about our trip here. I was two, and we traveled from Mexico to the United States, near Piedras Negras. From Texas, we traveled by car to Atlanta. There, we made our final trip to South Carolina, where close friends gave us shelter until my parents found jobs. My parents sacrificed their entire lives, savings, and safety to ensure a better life for me, their only child at the time. Despite only being two, there was a lot to adapt to in my new home, especially in school. The language barrier led to discrimination and bullying. I couldn’t ask my parents for help with my homework, because they only spoke Spanish. These struggles, I could overcome. The hardest part was keeping my undocumented status a secret. My experience growing up in America and South Carolina molded me into who I am today. It was in high school that I truly learned the weight and divisiveness of politics. I’ve always enjoyed conversation — hearing why people think the way they do, even if you can never agree. But, so many of my classmates, and even my teachers, seemed clueless as to why people come to America without papers and how hard life is here for undocumented immigrants. I used clubs and joining organizations to overcome the differences between me and other students. This semester, I began my freshman year at Christian Brothers University. I’m looking forward to exploring the opportunities and outreach programs throughout Memphis. After graduation, I hope to work to incorporate renewable energy into the aerospace industry and reduce our carbon footprint. For my fellow DREAMers, I encourage them to explore all of their options. 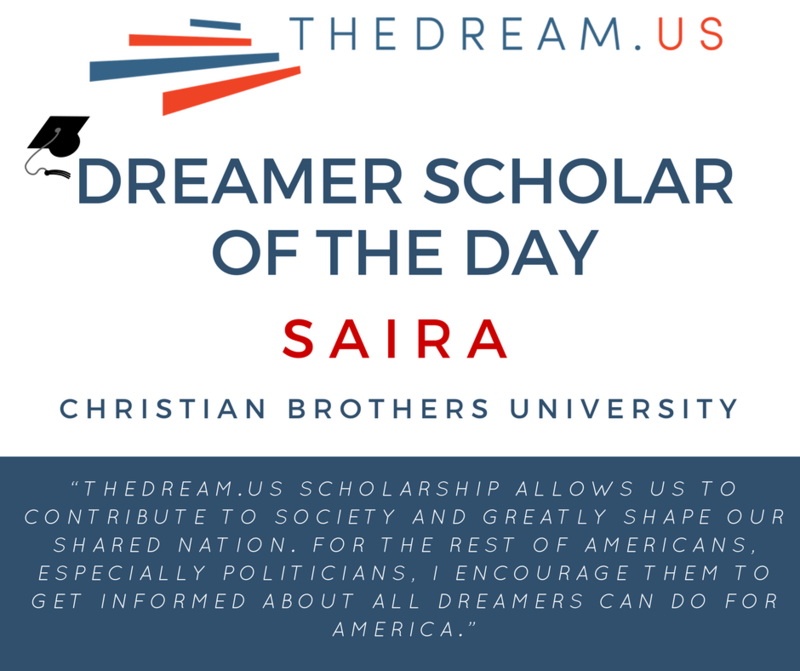 TheDream.US scholarship allows us to contribute to society and greatly shape our shared nation. For the rest of Americans, especially politicians, I encourage them to get informed about all DREAMers can do for America.